Take a look at two of the most exciting emerging AI technologies for marketers today. These days you can collect swathes of information about your intended audience from just about any source. 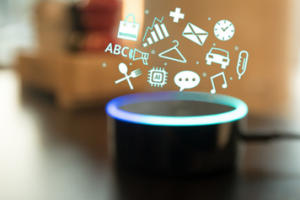 Thanks to the rise of the Internet of Things (IoT), pretty much everything we touch turns to data, from our Google searches to our Facebook likes to the smart appliances in our homes. This means that marketers can build more complete profiles of potential customers and the customer journey than ever before. With the right system in place, you can draw out and visualize insights in near real-time that give you a clear picture of how your marketing efforts are doing, where bottlenecks and inefficiencies are forming, and how you can redirect budgets and resources for better results. What’s more, as the pool of data balloons, the technology used to process this is getting more sophisticated, too. Now, you aren’t restricted to tools that help you analyze your data retrospectively: Top technology for marketers can now identify emerging trends, make predictions for the future, and even “learn” from what it’s looking at to decide for itself how to respond to that information. Let’s take a look at two of the most exciting emerging AI innovations for marketers today. Chatbots and virtual assistants work by making use of natural language processing, allowing you to talk to them using your normal speech – either in speech or text. The bot figures out what you need, retrieves the right information, and answers you in similarly humanoid language. This opens up tons of new opportunities for marketing teams, both inside your company and in your external relations with customers. Firstly, imagine how much time you’d save if every time you needed to grab some stats about your customer behavior or marketing campaign, you had an all-knowing, super-speedy data assistant to do it for you? Virtual data assistants like the Sisense bot do just that. Integrate them with your usual form of communication, and you can include them in the chat as and when you need, to save leaving the conversation to open up a new program or window to seek out the information you need. So, if you’re mid-conversation with colleagues over Slack or Facebook Messenger and want to quickly pull up your KPI dashboard, you can simply direct the request to the bot, typing this into the same chat window, and it will ping over whatever you need, pronto. Or, if you’re having a Skype conversation with an important client or partner and want to grab the latest sales figures for a set region, you can do the same thing – asking your chatbot / virtual assistant to deliver this to you, the same way you might ask Siri for directions or Alexa for the weather report – without breaking your stride. Those are just a few ways that virtual assistants and chatbots can make life easier for your internal marketing team, but they can also help to support your outreach efforts by automating and improving the way you interact with customers. For example, incorporating a chatbot into your website to answer some simple, straightforward questions means you can help customers to get what they need faster, 24/7 without needing more human resources to support this. We all know the importance of getting the right call to action at the end of (for example) a content marketing asset or online ad, but what if there are a couple of different directions your visitor might want to go in after, for example, they’ve read your blog post? Perhaps they’d like to see a demo. Perhaps they want to read a case study of how you deployed this solution for a similar customer. Perhaps they have an FAQ about how the product works. Perhaps they want a brochure, or even to set up a meeting with a sales rep.
Wouldn’t it be great if, instead of guessing or leaving them to trawl through the site in hopes of finding it, you could say, “What would you like to hear more about next? Tell the virtual assistant!” and have this handle the query for you, automatically? We know what you’re thinking – a bot can’t always get the answer 100% correct – and, of course, you’re right. The great thing is, though, chatbots are constantly learning from their mistakes, honing their ability to comprehend the question and locate the best answers. Plus, many sophisticated versions will quickly redirect to a real person if they can’t make sense of the query or detect that the customer is getting frustrated. Best of both worlds! Incorporating chatbots in this way can help you to hold the attention of the customer at vital stages in the buying journey, bringing them the marketing materials they want the most at that moment, while actually saving you time and effort along the way. Another powerful element of AI is the ability to personalize a person’s experience to create the best possible conditions for them to make a purchase. The more you know about a person, the more you can gauge things like; whether they are the right person in the company to make a purchase decision, what kind of product or service they’ll benefit from most, how your marketing aligns with their marketing cycle and how likely they are to buy. This isn’t just a case of profiling types of customers and segmenting your marketing campaigns. This is about using AI to get a clear picture of the specific person you’re dealing with, learning their behaviors and targeting appropriate marketing efforts to them automatically. Think of how Facebook advertising works, picking up on individual interests, tracking your likes and shares, and cross-referencing with things you’ve searched or viewed on other sites. Imagine how effective you could be if you could be as targeted with how you approach your own leads. Of course, AI can only be effective if the inputs it receives are top notch. That means the data you collect, collate, and analyze has to be complete, accurate, up-to-date, and easily accessible to the programs that use it, be they chatbots, virtual assistants, predictive analytics, or machine learning-based tools. After all, it won’t do you much good to call up your marketing dashboard in the middle of a conversation if the figures it shows are a week out of date. Getting a clear idea of which metrics and KPIs are most important to your business is essential – as is being able to move seamlessly between creating easy-to-understand dashboards and visualizations and drilling down to the really granular details that underpin these headline insights. When it comes to personalization, too, the more (reliable) data sources you use to help customize each customer’s experience, the more profound an effect this will have on your marketing efforts. With a powerful BI system to underpin your AI technology, you can draw in data from your CRM, Google Analytics, social media, sales records, and even customer support logs, treating all of these as a single data pool to work from. Getting a trusted data environment in place might only be the first step, but it’s a crucial one – one that has, in fact, been shown to double your chances of increasing revenue by 20%+. Without it, you’re 85% less likely to get analytics tools in place that do the job you need, too. So, remember: while the incredible new AI tools out there can do wonders for your marketing efforts and ROI, it’s the quality of the data that drives them that really decides the success of your campaign. Want to learn more about visualizing your marketing analytics with Sisense? Click here for some awesome dashboard examples.